White House designates the official residence and chief workplace of the President of the United States. Its design was conceived by the Irish-born architect James Hoban. Built between 1792 and 1800 largely employing white-painted Aquia sandstone in the late Georgian style, the White House has been the residence of all the U.S. Presidents since the time of John Adams. In 1801, when Thomas Jefferson shifted into the home, he, by consulting architect Benjamin Henry Latrobe, extended the building outward, making room for two colonnades meant to mask stables and storage. The building of present day White House was formerly known as the “Presidential Mansion”, “President’s Palace”, or “President’s House”. 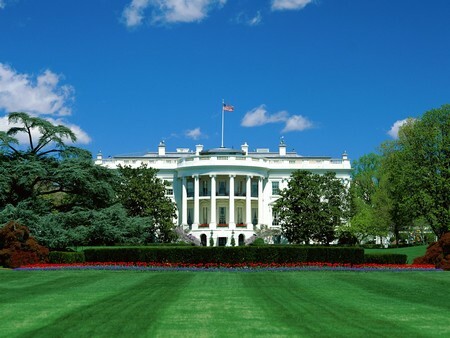 The earliest known evidence of the public pronouncing it “White House” was witnessed in 1811. The name “Executive Mansion”, however, was in vogue in official contexts as after President Theodore Roosevelt ruled out the formal name by having “White House–Washington” printed on the stationery in 1901. The recent letterhead title shows the arrangement, “The White House” with the word “Washington” centered beneath, dates back to the administration of Franklin Delano Roosevelt. During the War of 1812, in 1814, the house was set on fire by the British Army over the course of the Burning of Washington, ruining the interior and blazing a great proportion of the exterior. Renovation began soon afterwards, as the President James Monroe moved into the scantly refurbished house in October 1817. In 1824, rebuilding began with the addition of the South Portico and the North by 1829. In view of the crowding in the executive mansion, President Theodore Roosevelt had to shift all work offices to the West Wing in 1901. Less than a decade later, President William Howard Taft was able to expand the West Wing and furnished the first Oval Office to be moved at length as the section received expansion. The third-floor attic, however, was converted to residential quarters in 1927 by reinforcing the existing hip roof with longitudinal shed dormers. The new erection of East Wing was marked as reception area for social events; Jefferson’s colonnades had linked the new wings. East Wing adaptations finished in 1946, leaving additional space for office. In 1948, the load-bearing external walls of the house and internal wooden beams approaching a near collapse. Harry S. Truman, had the interior rooms completely disassembled and a new frame work of internalized load-bearing steel was erected inside the walls. Once this job was accomplished, the interior chambers were reconstructed.